Complete your Maryland landscape with a custom outdoor kitchen! Eating outside has become a growing trend in the United States which means outdoor kitchens are a great investment for homeowners. Have you considered the benefits of adding a relaxing place to cook and eat outside? If you decide to go this route, you will be happy that you did. What is the point of going out to a restaurant when you have something comparable in the comfort of your own backyard? 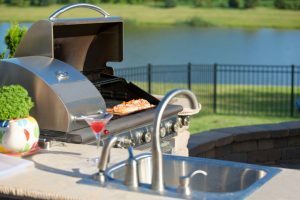 With the addition of an outdoor kitchen, you will end up saving tons of money over the years on hefty restaurant bills. If you want more living space, an outdoor kitchen may be right for you. Instead of building an addition onto your home, you can design your own outdoor kitchen. It will be a great place to socialize and enjoy a proper Maryland landscape. Do you love hosting parties? An outdoor kitchen is perfect for all kinds of social gatherings. In most cases, an outdoor kitchen offers plenty of space for guests to move around and interact with one another. An outdoor kitchen is a great selling feature to your home. To put it simply, it will add value to your home and make it much easier to sell in the future. Outdoor kitchens are a modern feature that are become more desirable because they give you the look of a true Maryland landscape. Grilled food is awesome. Something as simple as grilled chicken and vegetables is always a crowd pleaser. It is also a healthy cooking method because the unwanted fats drip from the meats. Therefore, grilling can help you lose weight because you avoid some of those unwanted calories in your meals. This entry was posted on Friday, May 19th, 2017 at 10:44 am. Both comments and pings are currently closed.